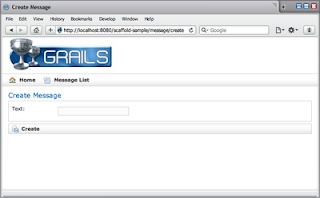 The scaffolding feature in Grails is impressive, especially when we want to show off Grails to other developers. Seems like magic is happening with only a minimal of code. But what if we don't like the default pages Grails generates for us. Of course there is a way to have another layout for the dynamically generated pages. After the script is finished we have a new directory src/templates. 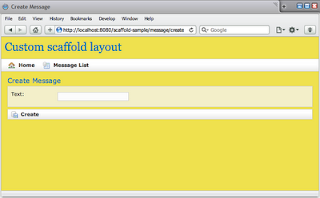 In this directory we find the scaffolding directory with a couple of GSP files. To change the layout of the pages we only have to make our changes here. Every controller which uses scaffolding will get these changes. Let's create a new CSS file and use it in the create.gsp, edit.gsp, list.gsp and show.gsp files. Besides a simple change like this, we can of course do anything we want with the GSP files that are used for scaffolding. In the above screenshot we can see for example we have removed the default Grails logo and replaced it with our own text.